The weekend is here and we are coming out of our "cool" front from yesterday and hopefully our surf action will benefit from the temperature drop. Our surf bite has been quiet this week and its not just our local beaches. Fort Pierce, South Hutchinson Island , and Hobe Sound beaches had spotty action at best. Whiting, bluefish, croakers, and a couple pompano were caught in slim numbers and this can only get better. The one positive note is the size of the whiting being caught. I caught half a dozen the other morning and they were all big whiting. I was targeting pompano so I moved on to try a couple of other beaches but I am sure the bite continued after I left. The northern beaches like Blue Heron, Avalon, and Round Island are all producing whiting. Orange Clam and Pink Shrimp Fishbites along with some clam strips are catching the whiting and croakers. 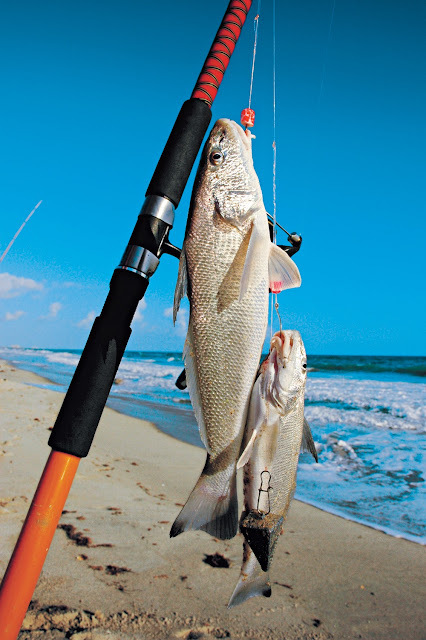 The bigger fish are being caught on the long rods from 60 to 80 yards off of the beach. The Seminar season is here and after receiving a phone call yesterday it appears I will be doing a Pompano Seminar at Bass Pro next Saturday , the 19th.I will confirm the exact time later today and be sure to post it. The tentative time is 330 PM and the admission is free. I will be covering some new topics like natural bait preparation, reading the beach and water color, spend a little more time on distance casting techniques , and will go over some of our local beaches that have changed the trough areas due to previous storms and sand shifting. Tackle, techniques, current hot spots, and a few other species will all be covered also. The Pompano Seminar is the most popular one that I do all year and I hope to see you there.